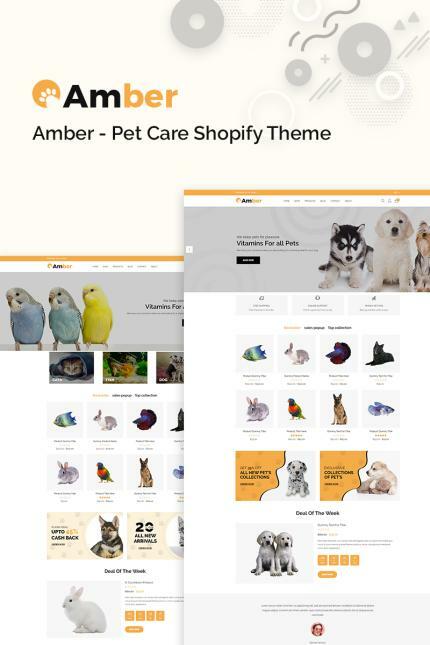 Amber - Pet Care Shopify Theme is a winsome eCommerce website design for dealing with Pet Selling, Pet Care, Pet Foods, Pet Dresses, Pet Cages and other Pet cosmetics or products. This neat, clean and creative website theme brings bulk of useful features for both the authors and the visitors. However, Amber responsive Shopify theme is superbly compatible with any web browser. Amber comes with 2 Home Versions, 9+ Sections and 15+ Preloader. It has Shopify Builder, Newsletter Popup, Multiple Currency, Header Style, Dropdown Menu, Notification Bar, Google Analytics and Mega Menu etc. On the other hand, Amber has excellent view and useful features for the visitors. It has Product Tab, Carousel, Category, Single and Multiple Banner, Service Page, Blog Page, Ajax cart and Wishlist, Newsletter, Footer Options, Product Share & Social media comment, Product Review, Contact Form, Shop Grid and List view, Short Codes and many more useful features. In addition, this neat, clean and creative design of Shopify theme has Well Documentation. Installing this theme is as easy as a piece of cake. But, the design, outfit and the other components are obviously of best quality. This theme can help you any time to boom your eCommerce business.